This album is fun. Score a CD sale to Spotify, where I listened to the first two tracks and knew I was in for the whole thing. I’ve heard Dr. John before, but not much. The long time New Orleans guitarist/pianist has a lengthy career, but I’ve mostly heard him guesting on others’ recordings, usually a marginal addition swallowed up in someone else’s sound. Years ago, I bought Robbie Robertson’s “Storyville” CD – inspired lyrically and musically by the New Orleans scene – one imagines funky beats, jazzy horns, blues rompers – all possibly twisted by a Cajun or Voodoo twist. In any case, it’s not quite the sound of the Quarter – it would be a hypothetical soundtrack of much cooler places that tourists would never know. In either case, Robertson, a gifted songwriter, didn’t deliver adequately. Now comes 71 year old Malcolm John Rebennack, Jr., Dr. John’s real name, who, with 20 albums in his career, has lived there long enough to get a truer feel. Whatever it is that I had hoped for with Robertson, he nails it here. I’m not familiar with his older work, but some say this CD harkens back to his late 60’s “Night Tripper” releases. In that case, you can judge a book by its cover. It fits. And the imagery also suggests it’s a thing of the night, which it very much is. Dark clubs, hot nights, people enjoying people – that’s the setting for the imaginary soundtrack. Sonically, this CD is everything I could ask for. Lush. Great beats, grooving organ melodies, dynamic horns, 60’s background vocals, ripping guitar leads... Produced and accompanied by The Black Key’s Dan Auerbach, it’s also modern in its clarity while losing nothing in its vibe. And much of that vibe is Dr. John’s aging voice, a gritty, energetic exclamation point that warrants no apologies here. 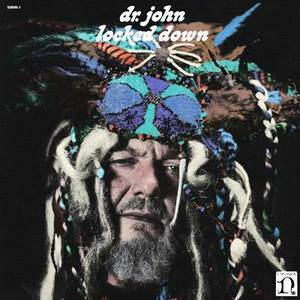 Lyrically, Dr. John delivers as well. Touching on age, the economy, faith, deceit, the struggle... sure, it’s timely, but issues of human nature aren’t limited to specific decades, and he’s been around to absorb it and capture it in a decidedly enjoyable, celebratory snapshot. It’s 42 minutes long, but it plays fast. Suggested Tracks: “Revolution,” “Eleggua,” “Locked Down” – but better enjoyed in its entirety.